The boats look fast and are fast. 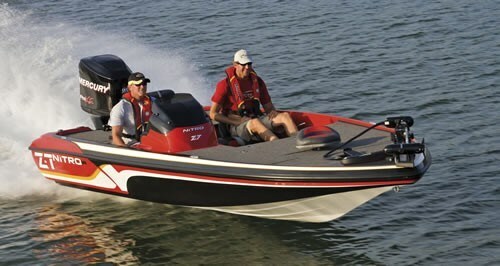 The modern day bass boat can easily hit 70 mph and have an extremely low profile with the water. This is to make them easy to maneuver around inland lakes and rivers and to get to the fish faster than the next guy. Often painted in metallic colours, these boats look as fast as they can go. Mostly made out of fiberglass, they can also be made out of aluminum. These boats are featured more in the Southern United States. Both have low profiles and are easily towed behind most SUV's and trucks to be taken from lake to lake, and tournament to tournament. Skeeter fishing boats, which is now owned by Yamaha, is considered as the developer of the modern bass boat as Holmes Thurmond launched his first boat in 1948. In 1961 he launched his first fiberglass boat, which was then a huge leap forward in performance and durability. The industry would be forever changed. Whether aluminum or fiberglass, the bass boat layout is pretty standard. The seating is often closer to the stern and low in the boat, with the bow and aft decks open as casting platforms. Full seats, or smaller "stool" style seats can be found in the bow or stern that give the angler a full 360 range of motion for casting. While many have large outboards on them, once at the fishing hole, the outboard is shut down and the trolling motor is deployed for stealthy and precision handling. Storage is usually abundant in the floors and gunnels to hand fishermen's large amount of gear. Many will often have more than one live/bait well, usually in the bow and the stern of the boat. Not only does this keep fish fresh, it also helps in tournament fishing as most are catch and release. The amount you can spend on a new bass boat is limitless. There's just as many toys and bells and whistles on a 20 foot bass boat as a 40 foot cruisers. If you're looking for a used bass boat, the trick is to find the one that's right for you that has the perfect mix of features and performance, because driving to the fishing hole is half the fun. Popular brands of new and used bass boats for sale include Tracker, Nitro, Ranger, Triton and Bass Cat, each offering their own spin on this classic design of fishing boat.